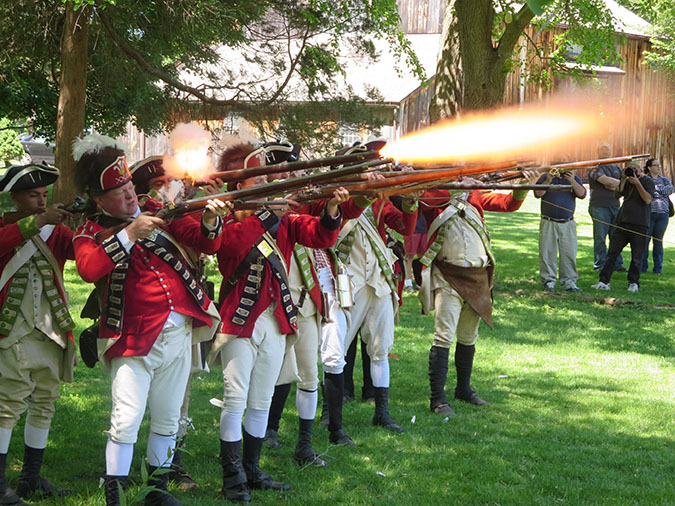 Calendar – 5th Connecticut Continental Line, Inc.
Memorial Day weekend begins with a bang at the Webb-Deane-Stevens Museum Revolutionary War Encampment. The fun begins at 10 a.m. on Saturday, May 25, 2018, at 211 Main St., following the Wethersfield Memorial Day parade, and lasts until 4 p.m.
During the WDS Revolutionary War Encampment, visitors can interact closely with the 5th Connecticut Regiment in full colonial dress, and enjoy entertaining demonstrations of 18th-century medicine, open-fire cookery, camp life, marching and musket firing and music. At 1 p.m. there will be a skirmish with a dashing band of British redcoats. Children are invited to learn to march and perform drills with wooden “muskets.” The ever-popular Big Bear Trading Company will be present with reproduction 18 and 19th-century wares for soldiers and civilians alike. Come learn about the town of Bethel during the American Revolution. Delancey’s Company (Loyalists) and 5th Connecticut Regiment (Continental Army) along with British Marines will be on the green with a full encampment. Soldiers will be drilling on the green with musket demonstrations. Period clothing, camp life, cooking, 18th century toys and games and kids’ wooden musket drills. A morning and afternoon skirmish may ensue as the Americans rally to defend the town against the British and Loyalist forces. More details and schedule to be announced. July 13, 2019 – July 14, 2019 – Hosted by the Brigade of the American Revolution. This living history event will focus heavily on the before, during and after of this famous moment in time. The event will feature constant interpretation and a wide range of educational programs including musket and artillery demos, maritime programs, vignettes from that fateful day and, of course, the assault itself. The 5th Connecticut’s Light Infantry unit was at the original battle, and our men and boys will return again to help mark the 240th anniversary of this historic event. The annual “DON’T MISS THIS ONE” event! Old Newgate Prison. A national historic landmark. Ruins of prison. Abandoned tunnels of old copper mine.